Rumsfeld Calls Paul Krugman's Sept. 11 Column 'Repugnant' : The Two-Way Krugman wrote that "the memory of 9/11 has been irrevocably poisoned" by President George W. Bush and others. 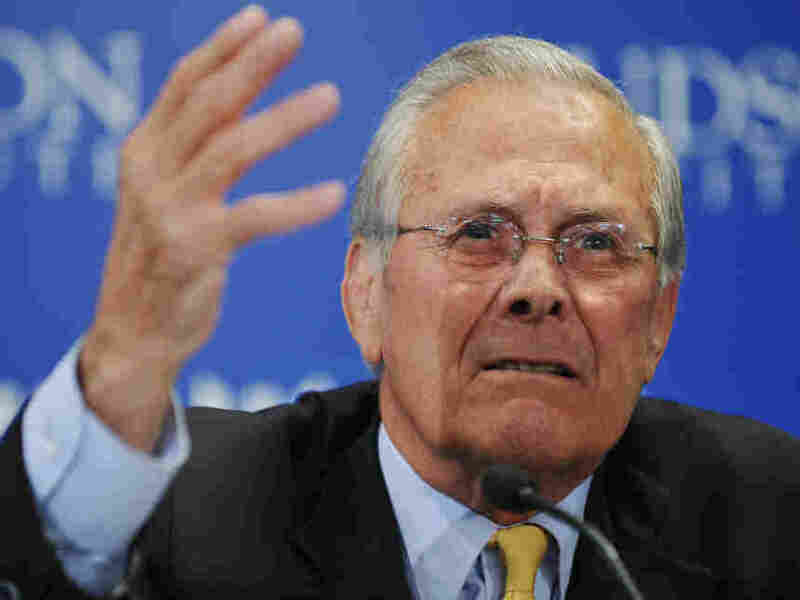 Rumsfeld, Bush's Defense secretary, is angry. Former Defense Secretary Donald Rumsfeld, in March 2011. "After reading Krugman's repugnant piece on 9/11, I cancelled my subscription to the New York Times this AM." That's the reaction on Twitter today from former Defense Secretary Donald Rumsfeld to "The Years of Shame" blog post published Sunday by New York Times columnist and Nobel Prize winning economist Paul Krugman. -- After the Sept. 11 attacks, "fake heroes like Bernie Kerik, Rudy Giuliani, and, yes, George W. Bush raced to cash in on the horror. And then the attack was used to justify an unrelated war." -- "Professional pundits ... took the easy way out, turning a blind eye to the corruption and lending their support to the hijacking of the atrocity." -- "The memory of 9/11 has been irrevocably poisoned; it has become an occasion for shame. And in its heart, the nation knows it." Krugman ended his post by saying "I'm not going to allow comments ... for obvious reasons." Update/Correction at 6:30 p.m. ET: Reader Stan Pedzick e-mailed to point out that Krugman used the word "fake" before heroes, and that I hadn't included that in the excerpt above. That was my mistake. I thought I had started the excerpt from the word fake, but obviously didn't and obviously didn't catch the omission. I've corrected it in the post. My apologies.